This February, seven people received their new service dogs. Each person was specially matched with their service dog to make sure they’ll be a good fit. The first time a person meets their new service dog is at Meet the Dogs. At that time, they don’t know which dog will ultimately become theirs. However, the matching process starts long before a person meets a dog. When we have a group of dogs in advanced training who are ready to begin the matching process, our trainers sit down and discuss what jobs each dog is best suited for and what type of person they would match best with. Not only have we been watching the dogs since they’ve been born, but our trainers have spent at least two months working closely with the dogs in advanced training. Each dog has strengths and weaknesses that make them better suited for different jobs. Once we figure out what kind of job a dog could do, we look at the waiting list to see who might be a potential match. Our waiting list is 1-3 years long, depending on the dogs we have available. We begin with people who have applied for successor dogs and then look at the people who have been on our waiting list the longest. At this point, we look at many different things. We look at the person’s home environment to make sure the dog’s energy level fits the physical environment they would live in. For example, we wouldn’t want to place a high energy dog with someone who lives in a small apartment. We also look at the person’s lifestyle. Do they travel a lot? Their dog would need to be comfortable flying or taking long road trips. Do they work in an office? The person may need a dog who’s happy spending most of the day sleeping. Are they always on the go? The dog would need to be more active and comfortable with continually changing environments. Does the person spend time in the hospital? The dog would need to be able to handle a hospital environment or be able to handle the stress of being temporarily separated from their person. We also look at whether the dog gets along with other animals and if they’re good with children. One of the most important things we look at is the tasks a person needs the dog to perform. We want to make sure the dog wants to do that type of work. When a dog enjoys the work they’re doing and their partner knows they enjoy it, then the team can really bond, and we know the team will be successful. All of these—and more—are factors we consider when determining if a dog and person are a potential match. If we think we have a potential match or matches, we invite the person to Meet the Dogs. The whole time, we watch the person and the dog. We know that the person picks the dog and the dog picks the person. Does the dog want to stay with the person? Were they eager to work for that person? Or do they wander away when left to their own choice? Is the person comfortable with the dog? Or do they tense up when the dog comes near? After meeting each dog, we ask the person to tell us what they liked and didn’t like about the dog, and then we have them rank the dogs. Based on all of this information and everything we’ve observed, we match the person with a service dog. There’s science behind each match, although sometimes it comes down to a gut feeling that a person and dog will suit. Once the match is made, we start training each dog specifically for their partner. We’ll share more about how we train dogs for their partners in a future post. If you haven’t read our last post about the new dogs who just entered advanced training, be sure to check it out! You’ll read about our dogs in training before they start the matching process. Twelve new dogs start their first semester of advanced training today! They’re joining seven dogs who are already in advanced training. 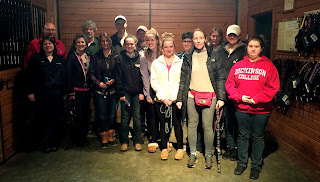 Last night raisers gathered at our kennel to officially turn in their dogs for this next step in their training. The dogs will now live at the kennel from Monday through Friday, going home to their raisers on weekends and holidays. Each dog was fitted for their new collar. Every dog in advanced training has their own unique collar, which helps us, raisers, and sitters tell the dogs apart. Dogs from the same litter are often in the kennel at the same time, and they can look a lot alike! Each dog also was fitted in their new green advanced training harness. During the dogs’ first 18 months, when they’re with their raisers, they wear the purple puppy-in-training harness. Green marks the next step in their journey. The most exciting part for the dogs was meeting their new roommate. Often roommates are siblings, and they have fun romping and playing together in their kennel run and outside, just like they did when they were tiny puppies. Play is an important part of our dogs’ day. Kennel life can be stressful for dogs. Not only is it a new environment, but it’s completely different than their home with their raisers. We make sure the dogs get to play in the field several times a day, and we put bones and chew toys in their kennel runs. We also have Walk and Cuddle volunteers, who do exactly that with the dogs. They take the dogs for fun, relaxing dog walks, play with them in the field, and cuddle with them in a separate, comfy area. Our Walk and Cuddle volunteers have been known to just bring a book and snuggle with the dogs while they read. Playtime and the Walk and Cuddle program help to reduce kennel stress. Although life at the kennel can be stressful for the dogs, it’s an important step in their service dog training. It gives us a chance to see how the dogs handle living in a new environment. When they become working service dogs, they’ll go to live with their new partner in a new environment with a completely different routine. We need to have confidence that our dogs will be able to handle that change. It wouldn’t be fair to either the dog or the partner if the dog became too stressed because of the environmental changes. So living at the kennel is an important part of the dogs’ training, but we do everything we can to make it fun and enjoyable. What will the dogs do in advanced training? The first few weeks are devoted to reviewing and polishing all 26 cues the dogs learned with their raisers. The dogs will also retake their 12-month evaluation, which lets us see if anything has changed in the past six months. As we get to know each dog, we start to get a feel for the type of work they might do best. We put them in a balance harness to see if they mind it. Balance harnesses have a hard handle for a person to hold, and the dog must be completely comfortable with this new equipment. We also test the dogs for hearing work. Not only does the dog need to recognize sounds, but they have to want to respond to those sounds. We see if the dog is interested is psychiatric service dog work or if they like to work next to a wheelchair. Our goal is to discover which type of work the dog likes best. We want all of our dogs to enjoy their service dog work. On Tuesdays and Thursdays, our new advanced training dogs will go out in public to places like Giant Food Stores, the mall, or Target. There, they’ll work with our public training volunteers, which will give us a chance to see how well the dogs work with different handlers. This is an exciting time in these dogs’ lives! Raisers can expect sleepy dogs when they pick them up this weekend. Thank you to all of the raisers who dropped their puppies-in-training off at the kennel last night! There are brand new puppies at Susquehanna Service Dogs! SSD Mali gave birth to six puppies on February 22. Meet the Ballroom Dance puppies! These puppies are just starting their journey to becoming service dogs. Over the next few weeks, we’ll share more information about how these puppies start learning to be service dogs from the time they’re just a few days old. All of our dogs learn the cue “heel.” On cue, the dog should pivot counter-clockwise until they’re parallel with their handler’s left side. Among other things, “heel” can position the dog for forward movement. It can also be used to create space between their handler and another person. We use clicker training, shaping, and a box to teach our puppies to heel. By having the dogs anchor their front paws on the box, they learn to move just their hind legs. One of our volunteers, Revenda Bierley, filmed each step in the process as she trained SSD Sabor to heel. Watch the video to see how Sabor goes from simply stepping on the box to pivoting into the heel position without the box. At the end of the video, SSD Aunt Laura, who’s going through Team Training with her new partner right now, demonstrates the completed behavior. Thank you, Revenda, for the awesome video!